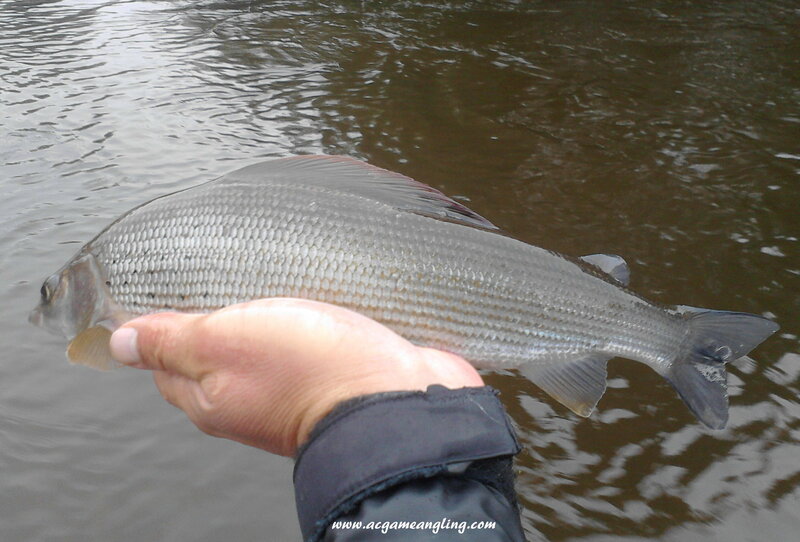 Went out for an hour at dinner time, there was supposed to be a lot of rain over Wales today but it had just been drizzling, so I thought I would have a go and see if I could find a big grayling, as I arrived at the river it was still slightly coloured not perfect but worth a go, in the first run I caught 4 grayling and 3 trout and by the look of it the river was getting more coloured, moving down to the next run it had a nice fast flow into a deeper glide, at the top of the run there were quite a few grayling, but as the water got deeper the takes seemed to dry up, watching the indicator on the French nymphing leader it very slowly stopped/stuttered, I lifted to the rod tip up and you could feel a dogged throbbing, this felt like a really good grayling and staying deep for quite some time I would have sworn it was a grayling then all hell broke loose, it took quite sometime before I even saw what I had on the end of my line, it had taken the black jig on the point and 3.5 lb tippet so I was suprised it was still on, as I got the fish to me I thought I could just slip the hook out and let him go, then he rolled several times and tangled the droppers around his head, a couple of more runs and I manged to get him in my net and un tangle the mess from around his head, quick pic and back in the river, he swam off really quickly and strongly, I don’t think I was playing the fish very long but the river had coloured quite badly, I did carry on for about twenty minutes but the river had died and I didn’t have another touch. The summer holidays are all over for my little boy, back to school tomorrow, so I asked him what he would like to do on his last day, for me the reply was music to my ears ” fishing ” he said, well the sun was shinning, it was lovely and warm and very rare for this summer as it has been rain and more rain , so off we went down the river for a few hours, he started of on dries with no real joy, so we moved to a faster run and I tackled him up with two nymphs, as he flicked them upstream and let them swing past him and down stream he shouted a fish just touched his fly, on the next cast he said another fish has had a go, he will tell me anything so I thought he might be just winding me up, but the very next cast he was into a nice grayling, he played it really well and I netted it for him, quick picture and it was on its way, handful of casts latter and another grayling came to the net, in around two hours he caught three grayling and a small trout, I was really pleased to see him getting a lot better at his fishing he is starting to sort his own tangles out and also unhook some of his own fish. Well his rod will be away untill the weekend and time to get his head into his school books, that’s not going to go down well as he is a real outdoors boy.